So, things have been a little crazy around here lately (what else is new?). ;) It's funny...things were supposed to be slowing down for a while here so that I could get a few "real" posts in, but it just hasn't happened! One thing that unexpectedly came up was a huge neighborhood-wide yard sale that will be held a week from today. I hadn't planned on doing a yard sale again anytime soon because they're so much work, but since everyone else is in charge of the advertising, and I do happen to have a lot of stuff I want to get rid of, it seemed like a logical idea to take part. As a result, I've been spending these past few days de-cluttering my house and getting boxes of stuff ready to price. On the same day as the yard sale, I'll be singing for a wedding (thankfully some of my extended family members decided to be part of the yard sale too, so things will still run smoothly while I'm gone...plus I'll have babysitters for the girls!). :) And then, the following Monday, the girls and I will be leaving for a 4 day trip. We're heading to the Los Angeles area for a visit with friends. So, needless to say, the posting may be pretty scarce for a bit, aside from a few sale updates from the Disney Store or other places. I'm planning on publishing my Media Musings posts within the next week, but I'm not sure if I'll have a chance to do any other posts before the yard sale and my trip. 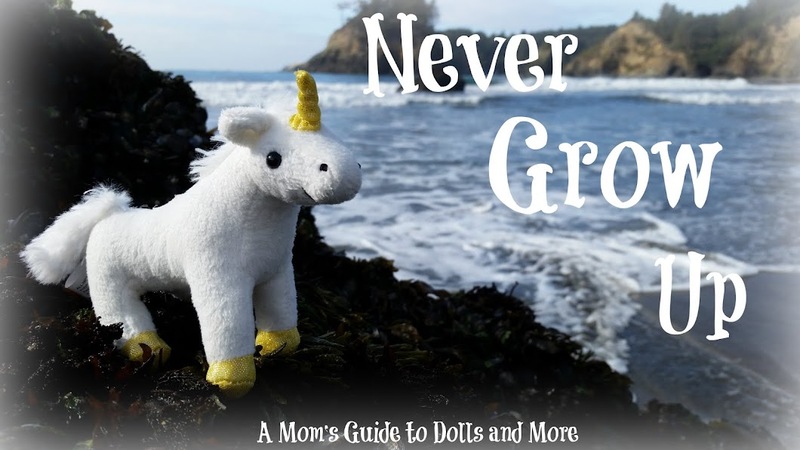 Posts will most likely be a bit bleak on Jane Austen and Unicorns and Belle's Bulletins, too. They have a difficult time posting when there are so many humans around. ;) I'll see if I can get them to do at least a little update post to tide you guys over, though. I guess that's about all for now. So far, Hubby isn't working today (Yay! ), so we might try to do something together once he wakes up. He's had a huge week and I pretty much didn't see him unless I stayed up till 11 pm each night. Ten years ago, I married my friend and high school sweetheart. Ten years ago, I wore a white dress that made me feel like Emma Woodhouse. I wore a long, filmy veil behind my curls and flowers in my hair. I did not wear shoes (best decision EVER), but my French pedicure and sparkly anklet made my feet feel elegant all the same. Ten years ago, you wore a black tuxedo and looked very dashing indeed. ;) You did wear shoes...until the end of the wedding, when you took them off and we ran down the aisle together. Ten years ago, we ate a whole pizza in our hotel room. Ten years ago, we dreamed about what the future would hold. Today, I look back on all of those memories and can't believe that ten years have already gone by. Today, I am so thankful for you. Your love, your unending patience with my mistakes and flaws, the way you can always make me laugh when I'm in a bad mood, the way you think I'm still as beautiful as the day you met me...how did I ever get so blessed? Today, we have three beautiful daughters who love you just as much as I do. Today, I realize that I never could have dreamed how much we would grow and change together. We've both become better people and better followers of Christ just by knowing each other. Today, I can't wait to see what the next 10 years will hold for us. 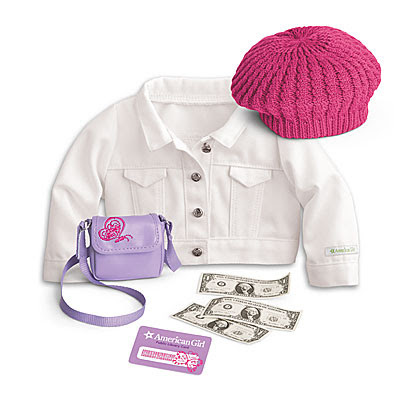 Late last night, American Girl released several new items. While most of these are not in my budget at this time, it was fun to see the new things. :) I won't put up photos of all of the new stuff, but I'll just touch on a few of my favorites. This is the Butterfly Garden PJ set. I love the colors on this one. I liked this one too. It's called the "Weekend Fun Outfit". I love the colors in the top. 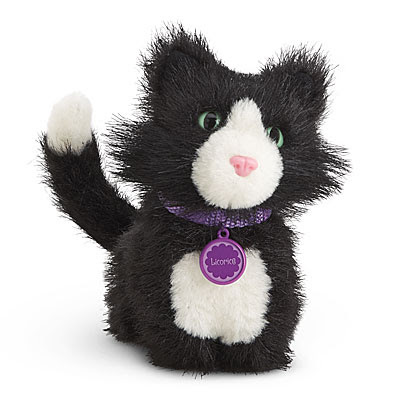 The other addition was a revamped Licorice the cat. 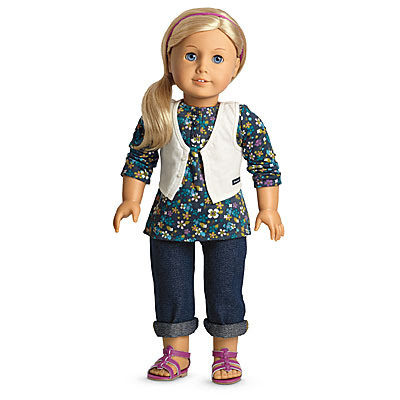 Some of my online doll friends really didn't care for her new look, but I think she's pretty cute. 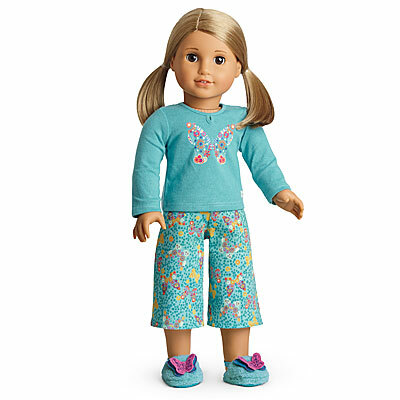 One other thing that really impressed me about American Girl's new releases was their attempt to reach out to girls outside of what we think of as the typical demographic. 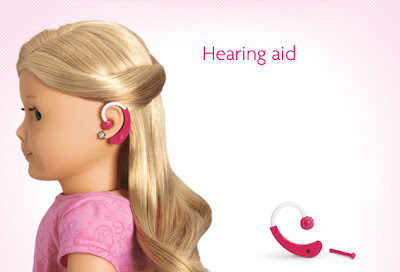 You can now have a hearing aid added to your doll. She goes to the doll hospital for a special fitting (they have to put a hole behind her ear to help it stay on), but the hearing aid is still removable. The other new addition is the option of purchasing a wigless doll. 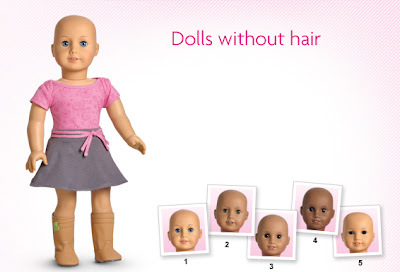 Now, little girls suffering from the effects of cancer can have a doll that looks just like them. 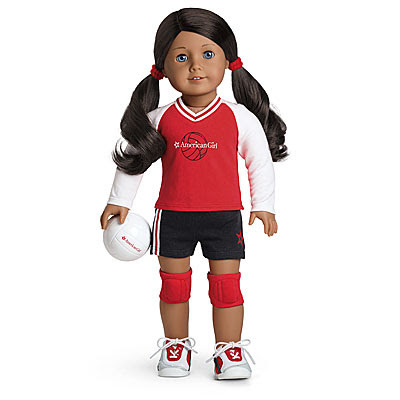 I applaud American Girl for this decision. By comparison, this allergy-free lunch seems a little unimpressive. But perhaps this will be an easy way for little girls with allergies, or their mothers, to explain to their friends why they have to be careful about the foods they eat. For many girls, this is a day to day reality. 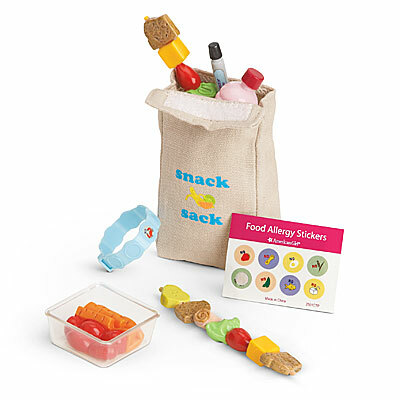 Why not give their dolls allergy-free food, too? 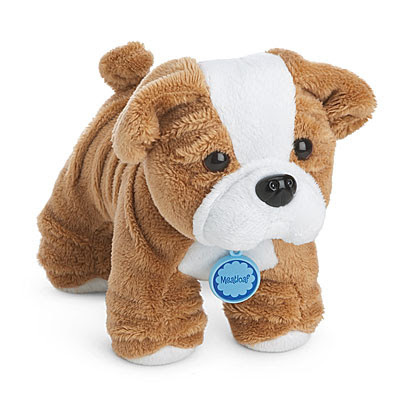 I didn't include the picture, but there is also a service dog set for the AG pets, which goes along the same lines. 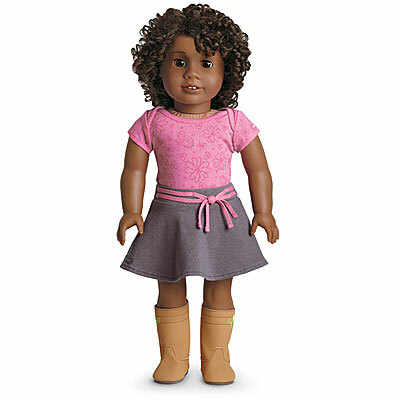 I think American Girl's effort to include those with physical handicaps or health issues in their products is absolutely wonderful. Growing up is hard enough when you blend in with everyone else. It's even harder when you have a condition that others may not understand or want to talk about. I think that these products would be a great way to start conversations and promote awareness of hearing loss, cancer, allergy problems, and blindness, a way to give our girls compassion and understanding for others. No matter what our differences, we're all human beings, created and loved by God. We don't have to be afraid just because someone is different. The only thing that would make it better would be if a portion of the proceeds from the sales of these special items went towards research in each coordinating category. How cool would that be? The Prince dolls appear to be exactly the same, and the clothing/accessory sets appear to be the same aside from different packaging. One thing that's a bit frustrating to me is that everything has gone up in price. The Prince and Princess dolls and the clothing sets are now $14.50 each instead of $12.50 each, or 2 for $22 instead of 2 for $20. I can understand about the Princess dolls...I'm sure having the extra poseable joints increases production cost. But to have them raise the prices on the Prince dolls and the clothing sets, which haven't changed, is a bit frustrating and disappointing. I know things are getting more expensive to make on the whole because of increased gas prices and things, so perhaps that's part of the price increase too. Hey everyone, just a quick post for now. I was in my local Target the other day and saw that the Play Wonder dolls by Madame Alexander were on the end of the aisle and were on sale for $24.95 each. This may possibly mean that they are phasing out the Play Wonder dolls. Then again, they may just be trying to clear out their current stock. I'm not sure if this is the case in every Target, but you might check yours, just in case. 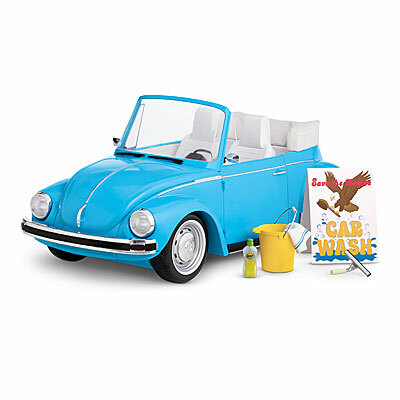 I checked Target's site online, and three of the dolls are on clearance there, too. 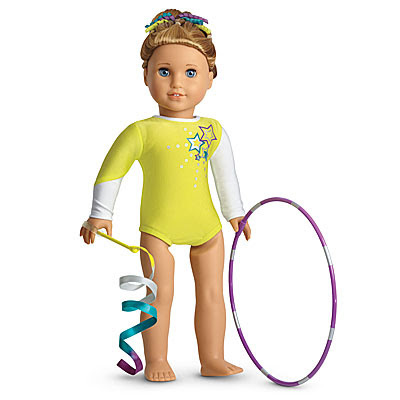 In fact, those three dolls are the only Play Wonder items left available to purchase online. The other dolls and all of the outfits are out of stock (although some are marked as "available in stores"), so this seems to confirm my suspicion that they may be phasing them out. You can see them HERE. I've had a lot of readers interested in this line, so I wanted to let everyone know. :) For those of you who are unfamiliar with these dolls, you can read my review HERE. As you can see, her dress, jewelry, her eyes, and even the lining of her box are extra sparkly, in keeping with the theme. Here's a view of the back of the box. Here's a close-up of all of the official info on the back of the box. Here's a closer look at her lovely face. I was a bit disappointed that they made her eyes green (a common error in Disney Belle dolls. Her eyes were brown in the movie...you'd think Disney and Mattel would be able to remember that.) ;) Nevertheless, she is a beautiful doll and I'm very happy with her. I don't have any more pictures or details because I'm not planning on deboxing her. 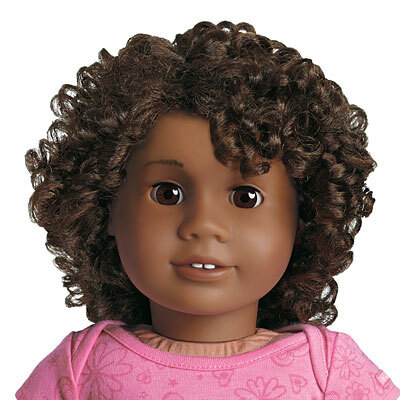 I would highly recommend this doll for any Belle fan, though. She's a wonderful, unique addition to my collection. Well, I ended up being able to go see "Brave" with my hubby after all tonight! :D Happy Early Anniversary to us! ;) I thought I'd share some of my thoughts about the movie while it was still fresh in my mind. This is not the post I thought I'd be writing after seeing Pixar's latest installment. I've come to expect the best from Pixar: a solid story with a great message, beautiful animation, fairly clean content, and a few laughs. Most of these things were present in Brave. The music was lovely, the animation simply breathtaking (especially the scenery and Merida's hair!! I heard they developed a special program just for all of those lovely red locks!). The positive message of family, especially as it relates to mothers and daughters, was very touching and made me want to rush home and hug my own girls. However, there were several issues I had with the movie that left me with mixed feelings as I plodded out of the theater. Instead of leaving with a huge grin and marveling over an amazing movie, I was left to wade through my muddled thoughts to try to figure out how I really felt about the film. Honestly, the story itself didn't seem as tightly wound as some of Pixar's previous films. It's nothing I can put my finger on...just some parts seemed rushed and some parts didn't seem to gel. It didn't click for me as much as some of their previous works. This itself is not a huge problem, and it's possible I might not even feel the same way if I saw it a second time, now that I know what to expect. As was mentioned in Plugged In's review, there was also a bit more crude humor in this one than there has been in the past. I think the parts that disturbed me the most were the naked bottoms in one quick but still "blech" scene (Really? Did you guys honestly think throwing in this cheap laugh was a good idea? Come on, Pixar! You're better than this!) and a quick joke involving ample cleavage. There were a few other small things, but these two scenes were the most disappointing for me. Like I mentioned, both are over in a matter of seconds, but I still wish they hadn't been included. I also had a hard time with some of the early scenes between Merida and Queen Elinor. The two exchange some heated, hurtful words, especially in one scene that's hard to watch as a mom. Later, Merida tricks her mother in order to try to get her to change her mind about forcing Merida to do something she doesn't want to do. The princess's thoughtless action unleashes unexpected tragedy as a result. There is also a witch character who is played more for laughs than for fright, but she still comes across as a bit creepy, and one part involving the character is a little intense. And for those of you who are not into magic and sorcery, you probably want to skip this film. Potions are made, spells cast, and a deep, mysterious sense of "fate" and "magic" pervades the entire movie. This may seem like a small thing to some, and I understand that it was played for laughs, but I have to admit it kind of bothered me the way Queen Elinor "wore the pants" in her relationship with King Fergus. I realize there are many relationships like this out there, and I do appreciate that Fergus was not just portrayed as a buffoon. However, I'm getting tired of the constant bombardment of the feminist movement in our movies and TV shows. It's almost like men aren't allowed to be the strong leaders in the relationship anymore. And finally, this movie had to be, without a doubt, the darkest, scariest Pixar film I've ever seen. The "demon bear Mor'du" is one freaky critter! I would have had nightmares for WEEKS if I'd watched this movie as a little girl from his parts alone! But worse than the just plain scary parts are the scary parts packed with emotional intensity. MAJOR SPOILER ALERT!!! DO NOT READ IF YOU WANT TO BE SURPRISED!!! One of the things I disliked the most as a mom involved Queen Elinor's transformation. Okay, so by now, between the previews and the marketing, we all know that the Queen changes into a bear, right? But what we don't know until watching the film (unless you're reading this spoiler) is that during her time as a bear, there are instances where Elinor forgets her humanity altogether and even threatens her daughter. I get it from a story point of view...I really do. This frightening occurrence adds a desperation and intensity to the story, and makes it even more vital that Merida find a way to break the spell. It also adds a huge emotional layer to Elinor's character as she comes out of her "bear mood" and realizes with horror what she's come close to doing. But having a mother figure turn into something scary and menacing? That's huge emotionally, especially for a movie that is mainly marketed for children. It was difficult for me to watch as an adult...there's no way my daughters would be able to handle the emotional scariness of those scenes. 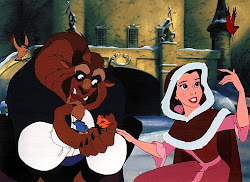 And let's not forget the scenes later on when Merida tries to convince her dad not to kill her mom (her dad is a mighty hunter and thinks the bear has killed the queen). Once again, the emotional intensity of those scenes is pretty extreme. END OF MAJOR SPOILER!!! END OF MAJOR SPOILER!!! Now, lest you think I despise the movie completely, I thought I'd share some of the things I liked about Brave. First off, there are quite a few parts that are laugh-out-loud funny. Pixar is great with comic timing, and this movie is no different. Between King Fergus, the adorable but full-of-mischief triplets, and the hilarious lords of the land, there are some great scenes that Hubby and I heartily enjoyed. Another thing I appreciated was the way the movie didn't go the route of the stereotypical overbearing mother and the stereotypical rebellious teen. 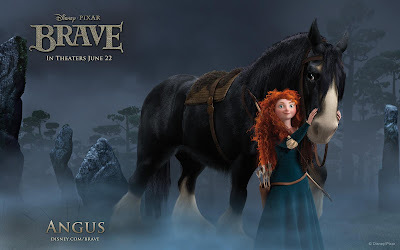 I thought they did an excellent job of making both Merida and Elinor layered characters that truly cared about one another but had lost their ability to connect and communicate. And I loved the fact that both characters had to grow and change in order to make amends. More and more, I'm learning as a mother that the best parenting involves training your children firmly, but with love. And it is vital to spend time with them, hear their side of things when it's appropriate, and try to remember how it felt to be their age. I think that this message is beautifully conveyed in Brave. 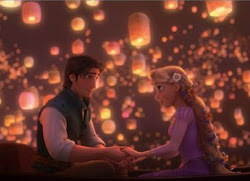 And as I said, the animation is simply stunning, and the music instantly swept me away with its haunting beauty. Sigh...it seems like they don't believe in making kids movies actually for kids anymore. Have any of you, my readers, seen the movie yet? What were your thoughts? Hayden loved the beautiful scenery and wading in the river. Also, stay tuned for parts 2 and 3 of my "Media Musings" series. 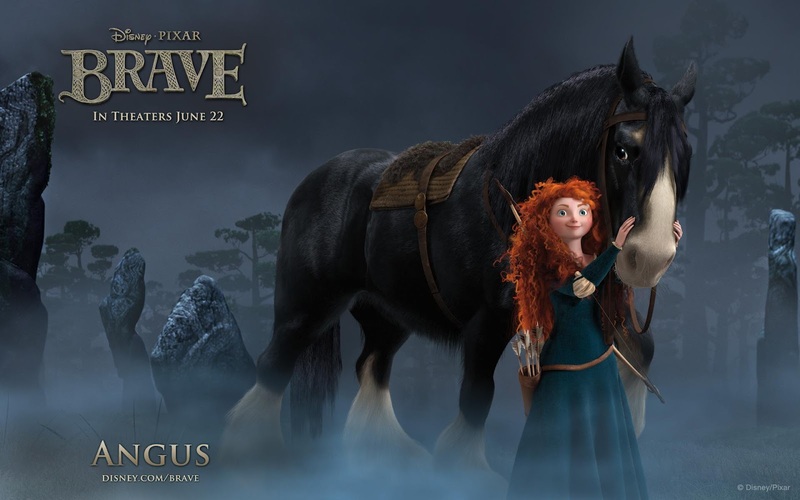 Disney Pixar's Brave officially opens in theaters today!! Yay!! I have been waiting for this movie to be released for such a long time. :) Hubby and I are going to try to see it today if we can get it in around his work schedule. I also wanted to let you know that your entire Disneystore.com order ships free with the purchase of any Brave items from now through Sunday! You need to apply the code "BRAVESHIP" at checkout. 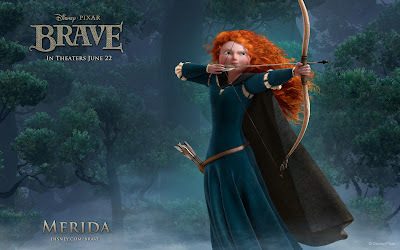 Hmm, maybe this is the weekend to get my classic Merida doll!! :D Click HERE to see Disney Store's Brave items. Because of my faith, there are certain things I look for and enjoy in the movies I watch. 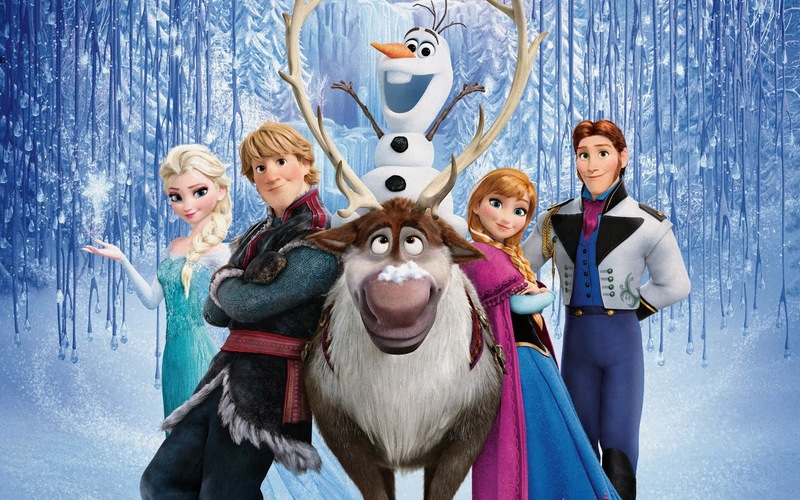 I'm definitely a fan of films that have a positive message, demonstrate a lesson learned in the lives of its characters, or illustrate a Biblical principle or truth that I can apply to my own life. I have a hard time with films that have an ambiguous message or no message at all. To me, everything I watch should have something in it that I can come away with and think about in my own life. In fact, many things I watch I will mull over for days afterwards, thinking over the plot lines and the moral of the story. I don't do much in the acting department anymore, aside from being involved in my church's Christmas and Easter cantatas. But it's funny...I've found that my writing has almost become an acting outlet for me. When I write my stories, I become the characters. It's a way for me to experience that same rush that I did on the stage, a chance for me to see what it's like to be someone else for a while. When I write, whether it's for the blogs or for my stories, I can see the entire scene I'm creating in my head like a movie. I love it because it makes me feel like my characters are real, living beings. Hopefully, if I feel that way about them, then I'll be able to pass that sense of realism on to my readers, too. 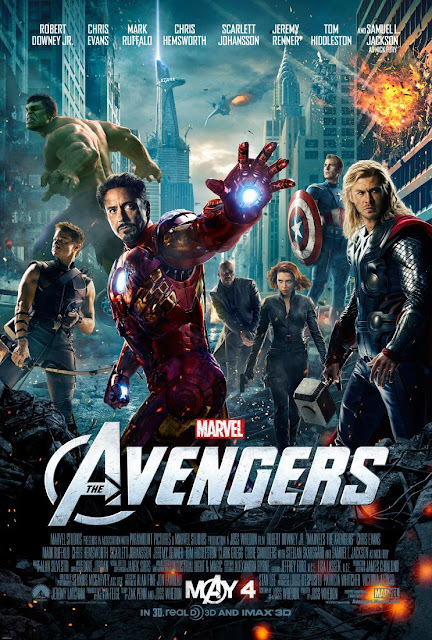 Negatives: violence, swearing, some innuendo, small mention of man "evolving", tight and low-cut clothing worn by Black Widow, creepy-looking alien bad guys; conflict and antagonism between major characters as they try to learn to get along. I've tried to keep this fairly simple and spoiler-free. If you'd like to have a more in-depth review before you decide whether or not to see it, you can go to Plugged In. They're a Christian media review website associated with Focus on the Family, and they list all objectionable (or possibly objectionable) content in every movie they review.